STIG pods have risen to be a simple solution for many making the switch from smoking to vaping. The reason for it is such a great solution for smokers making a switch is because it is a disposable pod system pre-filled with SaltNic E-Liquid that is 6% nicotine strength per volume and comes with a pre-charged built-in battery. It was designed to help make your life easier while you make your transition from smoking to vaping. Considering this, STIG pods will always be a delicious and more convenient option when you’re out there living your busy life. However, there may come a time where you may be curious to try out an ultra portable, low wattage, refillable pod system. For this reason, we at STIG have made a brief list of a few devices we think would be similar to vaping a STIG, but will offer you the ability to refill the pod with the same SaltNic e-liquid you have come to love and enjoy. Each device we have chosen are fairly simplistic in design, are on-draw devices just like the STIG pods and will provide a great vaping experience for mouth to lung vapers. The OVNS Cookie Starter Kit is an ultra tiny device that is lightweight, slim and shaped like a diamond that fits perfectly in the palm of your hand (53mm x 64mm x 11mm). The Cookie is an on-draw device with a 2ml refillable pod that utilizes a 1.4Ω coil to offer a generous amount of vapor and great flavor. The Cookie is powered by a 400mAh battery made for a constant output of 9.3W and can be recharged quickly via micro USB. A small LED battery indicator in the center of the device will flash before the battery is completely drained. The LED will light up while charging and turn off when the Cookie is fully charged. The Cookie has a tight draw and offers an excellent mouth to lung vaping experience. The Cookie pods prime quickly, but it is always recommended to let the e-liquid soak the cotton completely before using, so not to burn the cotton prematurely. The OVNS Cookie Starter Kit comes complete with (1) Cookie pod system, (1) 2ml Cookie replacement pod, (1) micro USB cable and a Cookie User Manual. Suorin is a very reputable company that has revolutionized open pod systems. Their Air and Drop pod systems are among the most popular in the vape industry. Both offer unique designs that are lightweight and small enough to fit in most pocket sizes. The Suorin Air is shaped similar to that of a credit card, it is very slim and is on draw activated. The Air is designed with an on/off switch and a single LED battery light indicator. It is powered by a 400mAh built in battery, has an max output of 15W and will last up to a few days (depending on your vaping habits). The Suorin Drop has a very original design as it is shaped after a water drop. It is thin, has no buttons to be concerned with, is comfortable to hold and fits perfectly in the palm of your hand. The Suorin Drop has a 310mAh built in battery with a maximum wattage output of 13W. It has a single hidden LED battery indicator light that lights up in the center of the Drop and looks like the heart of the device. 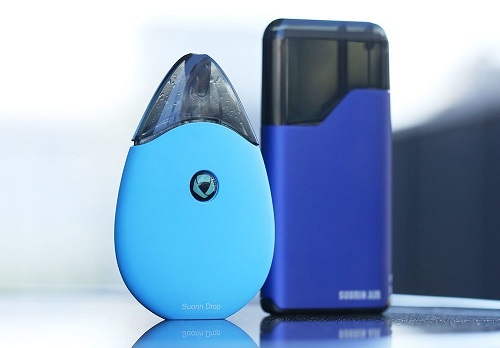 The Suorin Air pod has a 2ml e-liquid capacity with a built in 1.2Ω coil. The Suorin Drop also has a 2ml e-liquid capacity with a built in 1.4Ω coil. Both pods are easy to fill by simply removing small silicone tabs to find the fill hole. It is always recommended to wait 5 to 7 minutes to ensure the pod is properly primed and ready for vaping. Both the Air and Drop pod systems come complete with (1) device, (1) pod cartridge, (1) micro USB cable and a user manual. Either Suorin is recommended as they both are dependable systems that offer great flavor with tight draws and plenty of vapor production. The Vapeccino Mate 1 Starter Kit is absolutely top notch quality with a simplistic design and great technology to offer a very enjoyable vaping experience. The Mate 1 looks like your typical pod device, it is slightly larger than the rest on this list, but is still lightweight and portable in every right. It definitely feels durable, has a comfortable mouthpiece on the pod and is powered by an internal 410mAh battery. Vapeccino took their coil above and beyond by creating the Golden Core Tech. GCT utilizes Nano technology to defy oxidation and prevent e-juice residue from sticking to the coil, which prolongs the life of the vaporize. In addition to a long coil life, the GCT offers pure flavor and makes any e-liquid taste great! There are two pods available for MTL and DTL vaping styles. Both pods have different resistances, different sized air intake, but the Mate 1 can identify the atomizers automatically. Both pods can be distinguished by the color of the fill hole tabs. The MTL pod has a blue tab, while the DTL pod has a clear tab. Both tabs are not directly connected to the pod, so be mindful of where you place them while filling the pod with e-liquid. The Mate 1 Starter Kit includes (1) Mate 1 pod, (1) MTL refillable pod, (1) micro USB cable and a user manual. This Mate 1 system is a great way to go when you’re seeking out your first open pod system because it’s easy to get started with, battery life is consistent, flavor is amazing and it is an on draw device with no buttons to hassle with. That concludes our brief list of suggested open pod systems. We absolutely recommend any of the above pod systems and hope that you continue to have much success in your smoke free vaping journey. If you still have any lingering questions, please comment below and we will be happy to point you in the right direction.